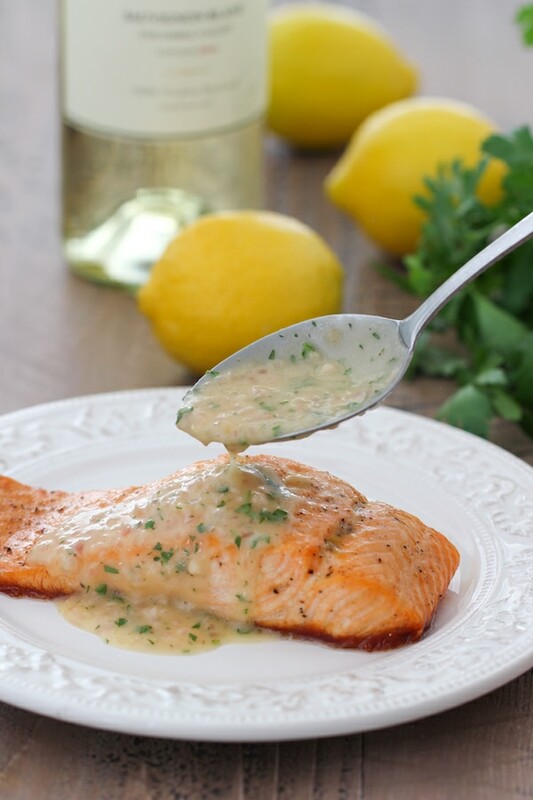 Individual portions of salmon are roasted in the oven and then served with a buttery and refreshing white wine and lemon butter sauce. The aromatic sauce has both creamy and acidic notes in it, complementing the fish so well. You guys! I’m so excited to share this recipe with you. 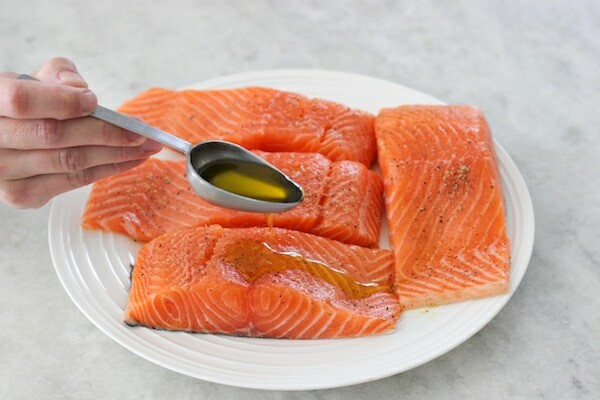 I absolutely love seafood and salmon is one of my favorites. Not only does it taste phenomenal and have amazing texture, it’s also so simple and quick to prepare. Like I mentioned before, being a night nurse has made me appreciate these quick weeknight dinners and because of that, I have an abundance of them up my sleeve. I roast the fish in the oven, first by preheating the oven to a roaring 500 degrees, and then decreasing the heat to 250 degrees Fahrenheit and cooking the fish at that low temperature. The salmon is SO JUICY. 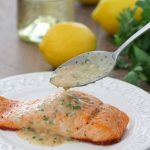 Four of the best accompanying flavors to salmon are all combined in this super sauce – white wine, lemon, butter and fresh herbs. 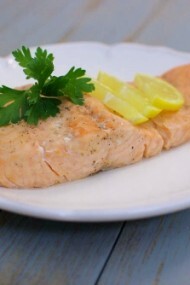 Served with a luscious white wine and lemon butter sauce, the salmon is coated with a punch of fresh, aromatic flavor. It’s also so creamy and velvety but the tartness cuts through the richness of the salmon. Preheat the oven to 500 degrees. 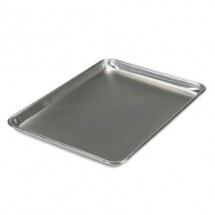 Place a rimmed baking sheet into the oven to heat up. You will need 4 equal portions of salmon fillets. I’ll share a tip with you: when you’re buying salmon at fish department, ask the seafood person to cut you the salmon portions from the center of the fillet. 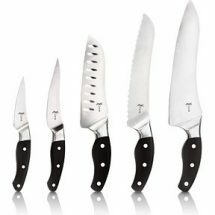 The portions of fish will be the thickest there and you’ll get the best use of your money and you won’t waste any of the fish. Season each fillet with salt and pepper and rub each fillet with oil all over. 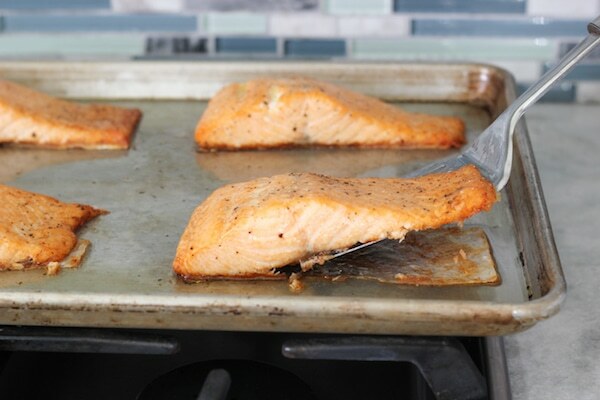 When the oven has preheated to 500 degrees and the baking sheet has been in the oven for about 10 minutes, take out the baking sheet and place the salmon, skin side down, onto the searingly hot baking sheet. You will hear it sizzle and the skin will start to sear right away. Place the fish in the preheated oven. Reduce the heat to 250 degrees and roast the fish for 12-15 minutes. The skin stays behind on the baking sheet, or, if you like fish skin, you can serve it with the fish. It gets really crisp and crunchy, so it’s perfect either way. While the fish is in the oven, melt 1/2 Tablespoon of butter in a skillet on medium high heat. Add the shallot and garlic clove. Season with salt and pepper. Cook them until the shallots are tender and start to turn golden. Deglaze the skillet with the white wine and then add the lemon juice. Turn the heat up to high and reduce the liquid until it has reduced to half the amount. 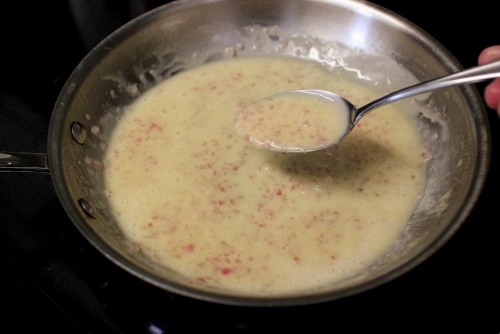 Turn off the heat and whisk in the butter, one Tablespoon at a time. The sauce will become thick and velvety. Add the parsley to the sauce. Spoon the sauce over the roasted fish and serve. Meanwhile, season each fillet with salt and ground black pepper and rub each fillet with oil all over. 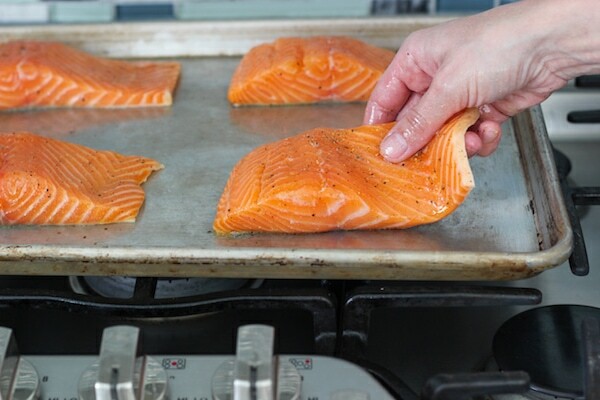 When the oven has preheated to 500 degrees and the baking sheet has been in the oven for about 10 minutes, take out the baking sheet and place the salmon, skin side down, onto the searingly hot baking sheet. You will hear it sizzle and the skin will start to sear right away. Place the fish in the preheated oven. Reduce the heat to 250 degrees and roast the fish for 15 minutes. While the fish is in the oven, melt 1/2 Tablespoon of butter in a skillet on medium high heat. 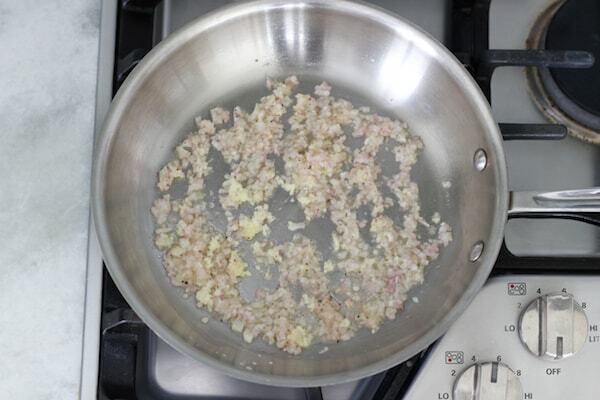 Add the shallot and garlic clove. Season with salt and pepper. Cook them until the shallots are tender and start to turn golden. Deglaze the skillet with the white wine and then add the lemon juice. Turn the heat up to high and reduce the liquid until it has reduced to half the amount. 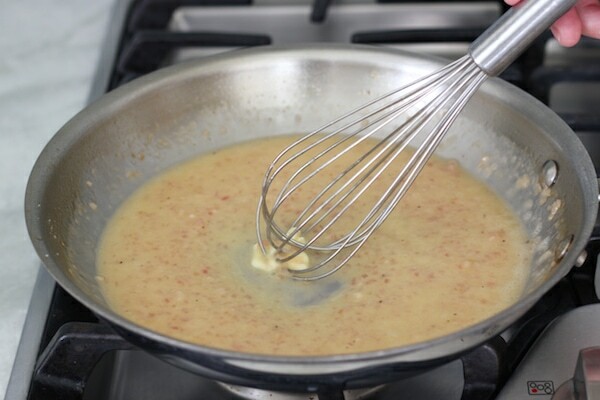 Turn off the heat and whisk in the butter, one Tablespoon at a time. The sauce will become thick and velvety. Add the parsley to the sauce. Spoon the sauce over the roasted fish and serve. Looks soooo delicious! My mouth is watering uncontrollably! I will have to make it as soon as I get home!! Awesome! The best thing about this dinner is that you can make it without too much planning in advance. 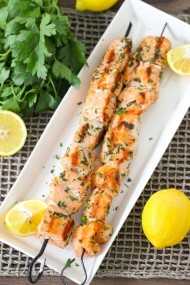 Feel like salmon, make it tonight:). I love this one. oh boy! this looks real good! Gotta try ASAP!!! My grocery hopping list today: White wine. Fresh Salmon! I could eat this every week. Seriously. I’d love to hear what you think:). Never made anything with dry white wine. It would be nice to see a picture of how it looks and where to buy. Thanks! Great question, Tanya! There are hundreds of white wine options. 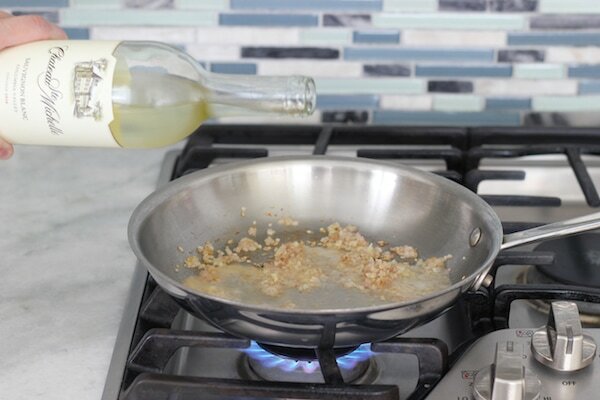 Use a dry white wine. I recommend either Sauvignon Blann, Reisling or Pino Grigio. Any substitudes for dry white wine? Hi, Olga, another great recipe!!! Thank you!!! My hubby went tuna fishing a couple weeks ago, we’ve canned it for winter, but still have e few fillets in the freezer…. Do you have any recipes with home cooked tuna, how to make delicious??? I would really appreciate your answer. Sorry, Nataly, I don’t have any recipes for tuna. 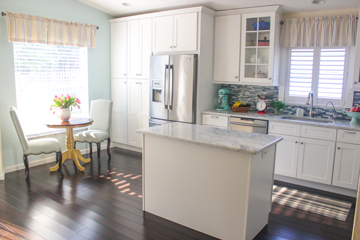 Another stellar recipe post Olga. You are doing tremendous work! 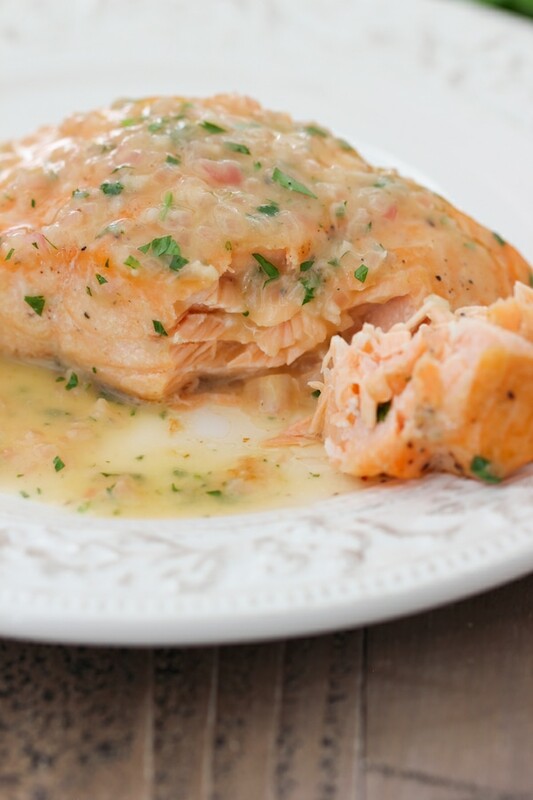 The salmon with this sauce is such a pleasant combination! Just enough acidity of the lemons to make the fish flavor and texture stand out! 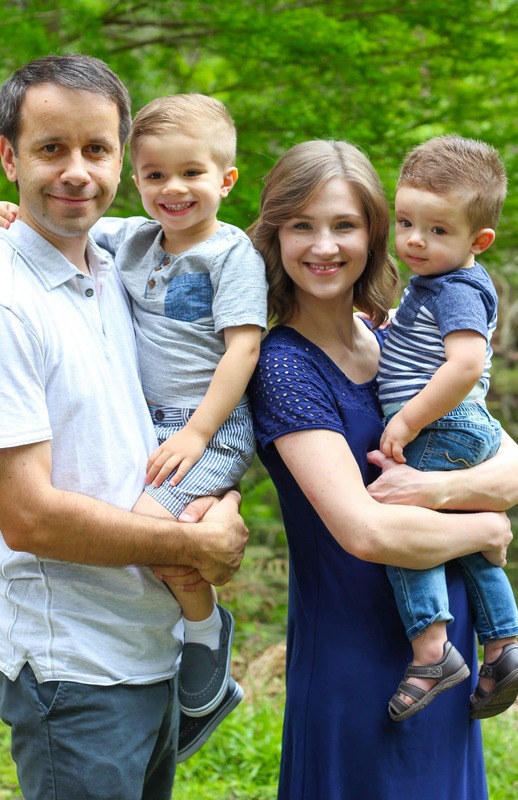 Keep up the wonderful work Olga! Lemons and fish go so well together; I absolutely always have them together. Fish just doesn’t taste the same without some sort of acid to balance it out. Glad to see that you like it too. That’s great, Yelena! I’m a huge fan of seafood. looks great I was wondering about cooing prawns in a sauce lie this what do you think ? I was actually thinking about the exact same thing last night! I think it would work great. I would sear the prawns first, take them off the heat and make the sauce in the same skillet and serve them together, or even return the prawns to the skillet for a few seconds just to heat through. I don’t know if you will see this. I just made this. Honestly, I think it might be the most delicious salmon recipe I’ve ever made. It’s amazing. I followed it exactly. The only change I made was I cut the recipe in half. I used cooking wine. It would probably taste even better if I used wine that was suitable for drinking. That’s awesome, Liz! I’m so happy that you enjoyed the salmon:). Thanks so much for taking the time to write. I was looking for a sauce to serve with my salmon and sautéed zucchini and onions tonight, and this looks just PERFECT! I love finding a recipe that makes me want to roll up my sleeves and jump in the kitchen. Look forward to tasting it!! ME too! I love when a recipe inspired me to get creative in the kitchen. I’m so glad you enjoyed this recipe. Delicious! Thanks so much for sharing! I really impressed my mother in law tonight with this recipe. That’s great, Linda. I’m so happy to hear that you enjoyed the recipe. Thank you so much for taking the time to write. Looks really delicious! Is there any way I can substitute the white wine? You can use vegetable broth instead, Angelika. I made this for dinner tonight. It is AMAZING!!! My family is crazy about it! 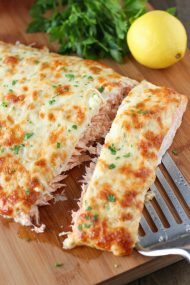 It is one of the best salmon recipes I have ever made! The way the salmon is cooked is brilliant! I never would have thought to do it that way. I will definitely make it again. I’m so happy to hear that, Karla. Thank you for taking the time to write. I just tried this recipe for our Christmas dinner. Everyone loved it, and so did I. I look forward to cooking this again. That’s great, Sherri. Thank you so much for taking the time to write. 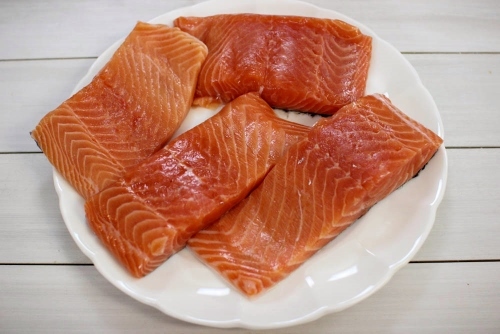 Hi Olga, I cook salmon and sauce, salmon turned out very good but sauce is not its don’t get tick as you said what is could be wrong? 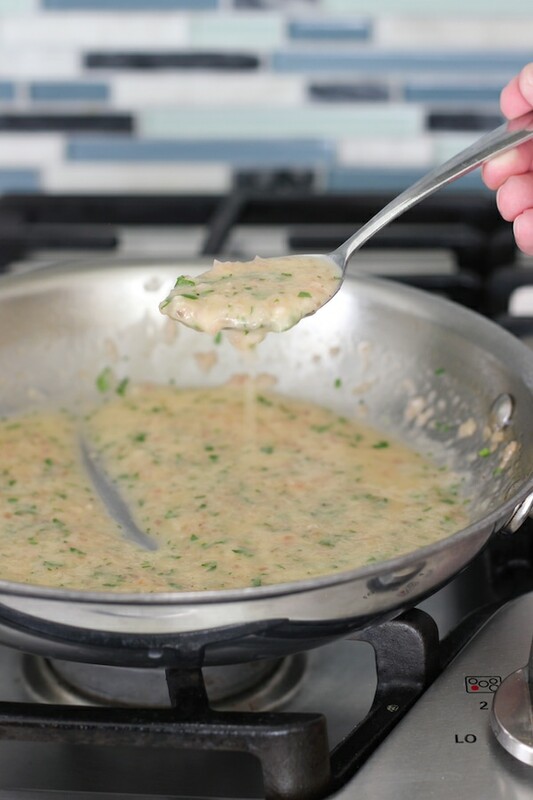 This is a pan sauce, and it’s not meant to be very thick, like a gravy. 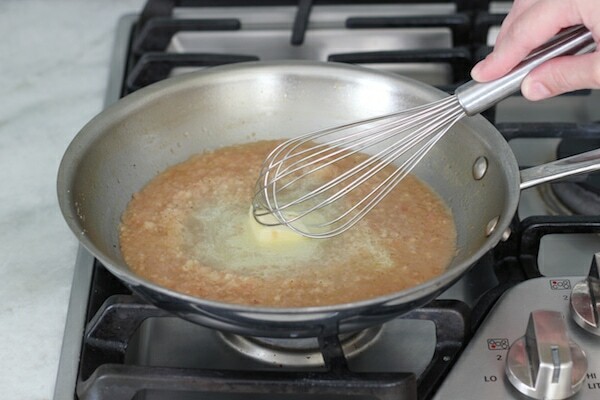 The liquid in the skillet should reduce by half, and it will get a little bit thicker, like a syrup consistency. If your liquid doesn’t reduce by half, it means that you haven’t cooked it long enough. If you want something thicker, you will need to use some sort of thickening agent, like flour or cornstarch, which would also be good, just different. 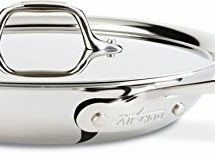 In that case, you would add the flour to the skillet first before adding the liquid (broth or wine) or whisk some cornstarch into some cold water, broth or wine and then add it to the skillet, which will thicken it up. I personally like a pan sauce better for delicate things like fish, since it just adds a lot of flavor, but doesn’t make the dish too heavy. Do you think this sauce will be good with tilapia? I made this tonight. The fish was PERFECT – I will definitely, absolutely cook salmon like that again. I was super hungry, so I kinda didn’t wait for the wine and lemon to reduce enough, but it was still soooo tasty! Thanks! My daughter thanks you, too. We’ve both been craving salmon and this recipe totally delivered. I made some rice pilaf and steamed asparagus as well — both ate well with the sauce! I’m making this delicious sounding sauce to spoon over lobster ravioli. 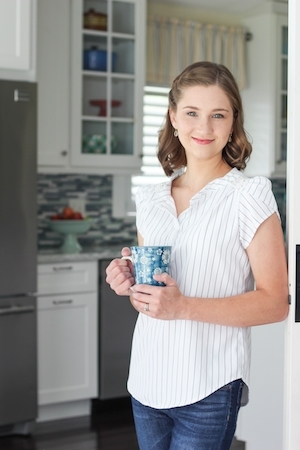 Can the recipe be easily doubled – or will I need to make the amount I need in 2 batches? Thanks so much! If you use a large skillet, it should be fine to double the recipe. 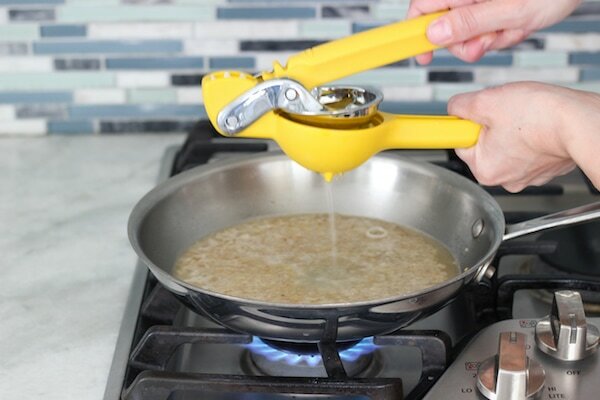 What a great idea to use it over lobster ravioli!